I am finally getting around to going through all of the pictures of my finished dress! But it is going to take another day or so before I am done. Until then, here is a preview of how everything turned out. I have to say, I am very pleased! Gorgeous dress. Am looking forward to seeing more pictures of it. Enjoyed watching all the different stages of sewing from start to finish. Such fun and an inspiration. wow - absolutely stunning! how tiny is your waist! can't wait to see more pics. Absolutely beautiful!!! I've enjoyed seeing how the dress was constructed from start to finish and it was so interesting. You are so talented. Hope to see more pictures of this lovely dress. And yes, your waist is tiny. The dress is beautiful and so flattering on you. 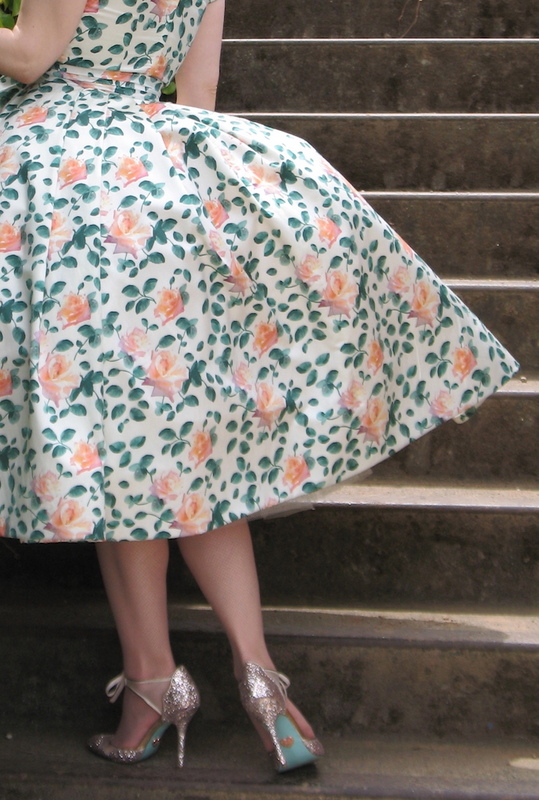 With such a full petticoat you will draw attention (but that is good). Absolutely stunning! Is this your dress for your annual charity gala event? Love love love the skirt fullness! WOW doesn't seem to cover that dress! And from what the pics show, you are stunning in it, too! Beautiful job. 💕 Love it! chic and elegant, and really shows off your figure to its best advantage. lovely. I have been waiting breathlessly to see the finished project! It looks to be a work of art! Oh, Laura Mae! It looks exquisite! Jaw droppingly, head turningly, mind blowingly stunning. Wow! What an amazing shape! The sleeves! The volumn of the skirt! I have been following the whole process, but my breath is def. taken away! "What you up to with Miss Ellen's portieres?"